Welcome to TWHL4! Please post any issues or bug reports in this thread. Wow! Good to finally see the new site being properly deployed. Good job! There are still a few bugs, though. If you click on the "Some time ago" text on journals on the main page, you will still be taken to the journal, even though the date shows up. ...there is still a one pixel overlap on the text at the top of the shoutbox. Keep up the good work, and I hope your arm gets better! I thought I fixed that pixel, Dr. Orange. I can't see it in Firefox or Chrome, which browser are you using? Just to be safe try Ctrl+F5 to reload the styles from the server too. I don't seem to be able to change the uploaded files for my maps. Attempting to upload a new file brings up a "Whoops, looks like something went wrong." page. File is not problematic, I successfully made the same edit on the beta site (before it was the actual site). I also tried a blank .zip file and had the same result. Other edits to the vault item that I tried ("files included", description) appear to function as expected. Also, I can see that pixel Dr. Orange mentions. Using Firefox, have Ctrl+F5'd. Is there a "time limit" when you update your profile? Because first time I tried the changes were not applied, it worked on second try tho. @Jessie: Try again now, thanks for the bug report. I had to set up file permissions on the server. @Jessie/Orange: I just made another fix that should hopefully stop the nefarious pixel, try reloading again. The Shoutbox is at the bottom right on desktop, just bottom on mobile. Oh hey, you boys finally made it public. For a second I thought 'have we been hacked?' No, it's just the new site design. It's a little bit of getting used to, but that's fine. Not sure how I feel about the Shoutbox being on the right, is there a way to move it to the left side of the page? It looks like that should be possible as the Shoutbox is a separate... thing, it isn't attached or isn't part of the main layout. Other than that, congrats on finally making the dang thing public. I prefer more the 2003 design, is more simple and easier to understand it. @Muzz: I could probably make a little options panel so you could move the shoutbox to the other side, I'll see what I can do. @Shepard: Goldsource programming has always been very under-resourced, so tutorials would be welcome! 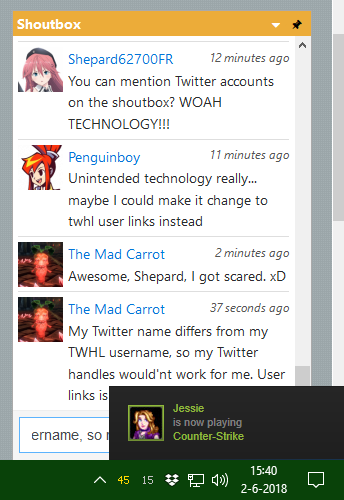 That'd be great, Penguin, I just got shoutboxbombed by Jesse while typing that shoutbox post. Edit: Already love the new formatting options. This is gonna take some getting used to, but I'm glad it's here. Got a few other nitpicks about the shoutbox. You can't see exact date and times on shoutbox messages like you can with everything else. Also, when the shoutbox updates and it's open, it automaticly scrolls down to the latest message, which can be a bit annoying when reading through previous messages. Hi! I checked my PMs and found a lot of old messages which I sent years ago. Old site didn't let me see them. So I want to delete them, but I can only delete 1 message at once. This isn't handy. Please add checkboxes to delete several messages at once. Thanks. By the way, I was shocked by new look of the site. And now it doesn't work correctly in old Opera (though I can accept this). Thanks for all the hard work you have put into the website over the years! 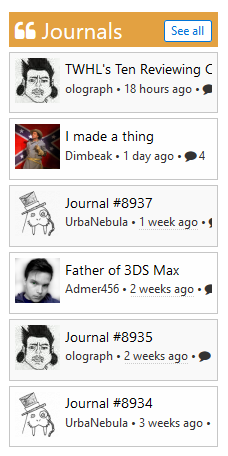 I miss the list of recently active users. @Orange: You can hover over the "x minutes ago" text to get the exact time, though admittedly that doesn't work on mobile. @Qwertyus: I didn't test on Opera since it's using the same rendering engine as Chrome... unless you're using the old version of Opera? I don't plan to support old browsers. @Penguinboy: Members would be a logical place, yes. I also think it would fit okay below the wiki edits on the front page. That's a good idea, I'll add it in at some point. It's not possible to see any image in the tutorial in the wiki section of the website. There is a "Image Not Found"
@Pouli: Thanks for letting me know, I have fixed the tutorial images. TWHL looks nice and works well. But I am here to vouch for removing the auto-locking of threads. People coming here with complicated projects that need a few months between updates find their threads locked after 90 days. And then you are naturally hesitant to open up a new thread just to continue the original thread - which has the feeling of using the forum wrong or posting unwelcome spam. Likewise, I've posted about my own stuff here long ago where there was a lot of work involved for little attention. A normal update to the respective thread couldn't be made later on and I didn't want to bother the community with new dead thread stubs. The merit of autolocking is that you don't have to deal with necro-bumps, but as it's configured now, I'm convinced that this downside outweighs the hassle occasional moderation of an unjustified bump greatly. It would be great of the timeout was removed or bumped up to at least a year. Thanks for all the work you've invested. @Shrinker: Thanks for the feedback, but TWHL3 previously locked old threads after 3 months as well. At the moment you can contact an admin (just ask in the shoutbox) and somebody will unlock and old thread. I think you do raise a good point about extending the dead-thread time limit though. I'll extend it when I get the time, and monitor how it goes. Maybe you could build in some way to flag certain admin-only things, like thread-revival requests and name-change requests. "I don't like how map vault entries no longer tell you the date at which a given map was uploaded, like it did with TWHL3"
Click on the date. It expands from "X years ago" to the exact date. As long as we're on the topic, some of those toggleable timestamps are also part of the links to the things they represent. That is, if you click on the timestamp to see the exact time something was posted, you will also click on the item itself and thus the page changes, which generally is not what you would want. This is true for maps when you are browsing the map vault, and the front page journals and wiki edits. There could well be more, but those are the ones I've noticed. I love the new design. Best of all, we all had plenty of opportunity to contribute ideas toward the new site during the soft opening. Kudos to all the hard work! Long live TWHL! I can't believe that I have been a member for so long. I don't know how important it is, but when you look at Atom's post history the earliest ones aren't in the correct order. They seem to be in the right order for me, unless I’m missing something. Edit: Oh, post number. I was looking at date/time. They're sorted by date rather than ID number, so I'm guessing there's some oddities with the really old data that causes that to happen. I like how on mobile the new maps section of the main page is its own scrolly bit to fit the four on there, but - and maybe this is just my exact phone - it’s not immediately obvious that there are more than two maps there. I don’t know how you indicate that it’s a scrolly bit, just that it probably should. I could probably do something for that, I'll try it out later. But where is the shoutbox? There's some text cut-off issues with the journals at some window sizes. I propose moving the Active Users module above the Journals and Wiki Edits modules. It makes more sense to me that way. Oh no, I disagree. That doesn't seem like an element that needs to be that prominent. It's nice that it's there, but it's not what you come to the site to see. I'm open to suggestions since I'm definitely crap at design, but I think the size of the h1 headings is fine in this case. I don't really want them any smaller. Can you only use WAD include with nem's batch compiler? "New In The Vault" panel on the front page also displays recently updated vault submissions. The problem comes if a bunch of maps are updated at once, it floods out actual new maps on the front page. I just updated all of my maps to have a CC license (now that you can set that in the vault) and at the same time was unknowingly flooding out all of the new maps (including my own newest map) on the front page. I noticed that too, but I quite liked all my maps showing on the homepage, so I didn't say anything. At the very least, my new map is back on top because I realized we can finally add more screenshots and I messed up a file path that led to a missing model error and had to reupload it. Luckily it only got downloaded once from each of the 3 places it's uploaded and one of those downloaders is the one that noted the problem. Processed in an astoundingly quaint 1674 milliseconds.